It’s just after 9 a.m. on a Saturday morning, and two construction workers are already seated at the tables inside the Miller & Long Cantrall Training Center in Bethesda, Maryland. They’re dressed weekend casual – a white short-sleeved tee for one and a light gray jacket for the other; both wear blue jeans. No work, no hard hats. 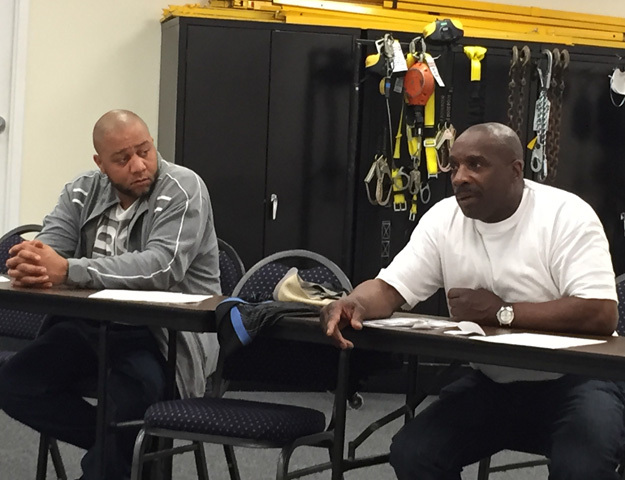 For them and four other formerly incarcerated employees, this day off means coming together for a returning citizens forum about their daily struggles on – and off – the job. Surrounded by fellow workers at his first forum, Dartangan “Tang” Page, 20, expressed frustrations over a recent incident when his timeliness on the site was questioned. 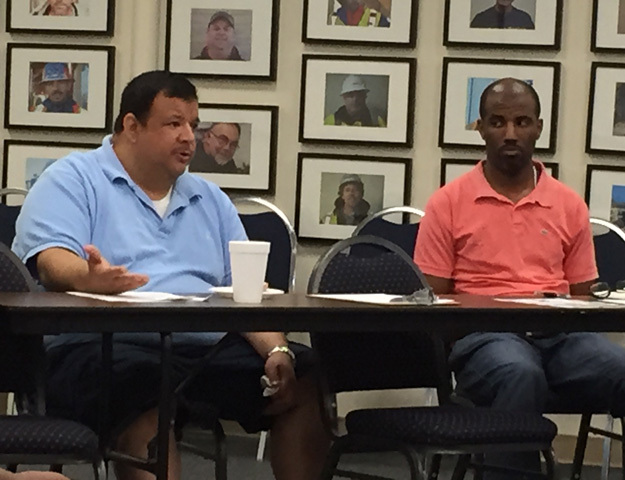 His experience sparked a conversation over attendance and workplace communication with job foremen, among key issues workers face when transitioning back into the workforce after serving time. “I lived in Montgomery County, I’m in the sticks. There’s only one bus I could catch when I first started that could get me anywhere near the job site on time,” said Dairon “Bo” Upshur, a safety manager at Miller & Long, remembering when he took a 5:30 a.m. bus that got him to work “an hour and some change” early. On a separate job, he got up at 5:30 a.m. but “no matter what” could not get to the site on time. Those experiences, he said, made him work towards getting a car. He’s had three since working at Miller & Long. real talk Damon “Pizza” Valentine (left) listens as Steve “Baby Love” Smith has the floor during the forum’s “Men’s Rap” session. These men shared their experiences – and advice – as part of “Men’s Rap,” the most popular segment of the forum, where employees can vent and air their frustrations in a healthy way and get positive feedback from their peers and company management, according to Otto Girr, vice president of human resources for Miller & Long Concrete Construction. “We try to address topics that we see will help the guys develop positive habits and communication skills that will keep them successful,” said Girr. Although Page was the youngest member of the group this day, every man in the room had once walked in his work boots. Because of this, forum participants are comfortable having an open dialogue spanning work and life issues, including health and wellness, money management, conflict resolution and peer communication. Since the voluntary discussions started in April 2011 to help new hires stay successfully employed, Miller & Long has seen an increase in retention of qualified workers. “We have not only had more employees remain employed, but they have been promoted to higher positions of authority and responsibility,” said Girr, noting that turnover for returning citizens is dropping and is no longer three times higher than that of non-offenders. MONEY MATTERS 101 Otto Girr (left) and Luis M. Campos, part of Miller & Long’s HR team, stress the importance of saving money and being financially fit. Kenny Glover is one of those success stories. Now a human resources specialist with Miller & Long, Glover started out as a carpenter helper in 2003. He knows first-hand the benefits of having a safe space to unload one’s feelings. And the forum’s goals reach beyond the present. Girr adds that they are also working to reduce recidivism rates. “Research has shown that the longer a returning citizen remains employed, the less likely he is to be reincarcerated,” he said. Just days earlier, Keith Gaffney, 31, had received his forklift license. With Miller & Long since July 2014, he credits the returning citizens forums for helping him rebuild his life. “This is what I need,” said Gaffney. Within the next five years, he aims to work in an office, sport a suit and use his “mind more” than his hands. 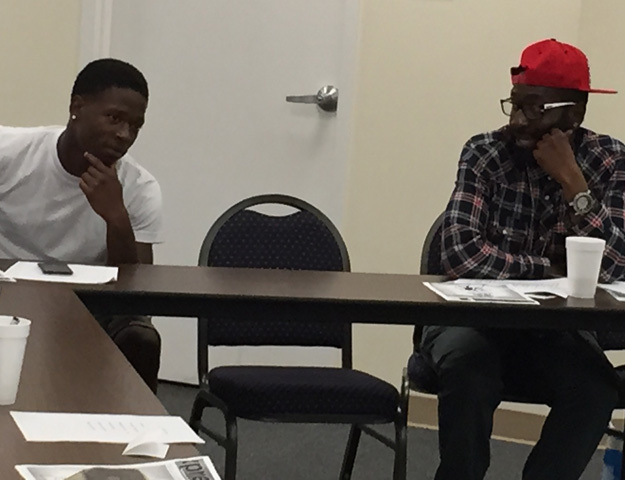 Led by Glover, the May 9 forum covered numerous aspects of coming home, finding employment and living day-to-day. This session tackled the issues of friends and family asking for money, work and life attitudes, coping with conflict at work, language barriers between workers and foremen, savings and retirement, as well as attendance and transportation challenges. These forums regularly have guest speakers to address these topics, and for the latest session, Glover invited a resource from the District’s Court Services and Offender Supervision Agency. 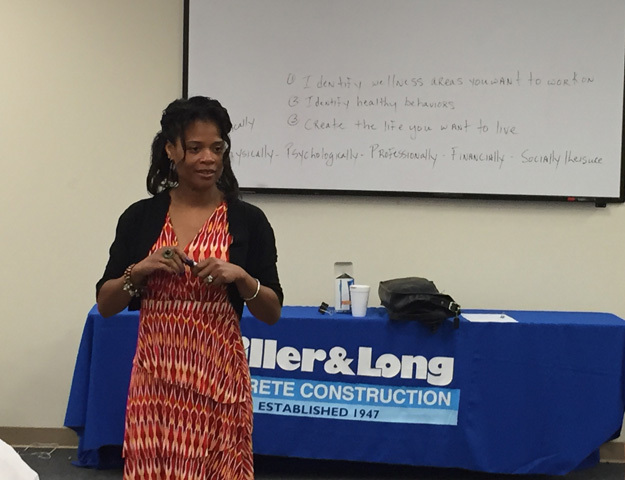 Tanya Johnson, vocational development specialist of Community Justice Programs for CSOSA, discussed wellness and its personal impact on the men’s lives. She engaged attendees by asking them how they defined wellness and how well they did with staying emotionally, physically, socially and financially healthy. She asked questions like: Everybody getting annual checkups? Does everyone have someone he can talk to? What things are you doing professionally to build yourself up? Johnson also encouraged everyone to complete a self-assessment to evaluate his overall well-being. BALANCING ACT CSOSA’s Tanya Johnson encourages the group to maintain work/ life balance. Miller & Long’s human resources team offered money management tips that could help its formerly incarcerated employees long term. Girr urged workers to set up bank, retirement and credit union accounts. “If you don’t develop the good habits now, you will regret it later on,” stated Girr, before offering to help those who don’t already have bank accounts. While the forums have made significant strides in keeping workers who regularly attend employed, there is still much left to accomplish. According to Glover, housing referral resources remain slim. “We can send them to a shelter, but that’s like an institution because it’s an open bed place,” he said, noting shelters have a dorm setting like many prisons.